Die Villa weist drei Ebenen auf, die sowohl auf der Rückseite als auch auf der Vorderseite Zugang von der Straße haben. Ein Doppel- und Zweibettschlafzimmer ist auf der oberen Ebene, von wo einige Stufen hinab ins Badezimmer (mit Dusche, Waschbecken und WC) führen. Auf nächster Ebene und einige weitere Stufen abwärts liegen die Küche und das Hauptwohnzimmer. Das Wohnzimmer hat einen direkten Zugang zu großen Terrassen, die eine herrliche Aussicht auf das Meer und die umliegenden Hügel bieten. Das Studio befindet sich auf Straßenhöhe, hat eine voll eingerichtete Küche mit Essbereich, eigenes Badezimmer und eigenen Eingang. Die Villa ist ausgestattet mit Waschmaschine/Bügelbrett, Bügeleisen usw. Ein Babyhochstuhl und ein Kinderbett können organisiert werden. et le jardin qui est un véritable enchantement. Tout est conforme au descriptif, très propre. la literie est de bonne qualité, la cuisine très bien équipée. L'environnement est très agréable, calme, et proche à la fois de Tossa de Mar et de Lloret. L'accès à de magnifiques criques très sauvegardées est aisé grâce à la route des corniches. En ce qui concerne les plages, il n'y a que l'embarras du choix. Séjour des plus agréable et découverte d'une magnifique région. Nous reviendrons sans doute.. It was a great pleasure having you at our villa. THANK YOU! wonderful place, we recommend it to our friends. The house was lovely and located at a beautiful place. There was a big terrace with a pretty view. The house was clean and provided for all necessities. Sherzad greeted us friendly at arrival. We had a wonderful week. Grande terrasse avec salon de jardin et transat bien exposée. Cuisine bien équipée, nombreux appareils electro et vaisselle suffisante. Chambre de taille correcte avec rangement suffisant. Un patio avec lave linge et sèche linge avec étendoir bien pratique. Piscine à 3 ou 4 minutes à pied: nous étions souvent seuls dans cette très grande piscine. Un bonheur pour les enfants. La crique proche de la maison est très belle. Nous y avons passé une très bonne semaine et nous y retournerons bien volontiers. Nous avons été très bien accueilli et avons trouvé à notre arrivée eau vin et délicieux fruits. It was a pleasure to have you in our villa. It will be very nice to see you all again. We (a family, 4 children 10-20 y.) spent our 3 week holiday in the clean villa, fully equipped. 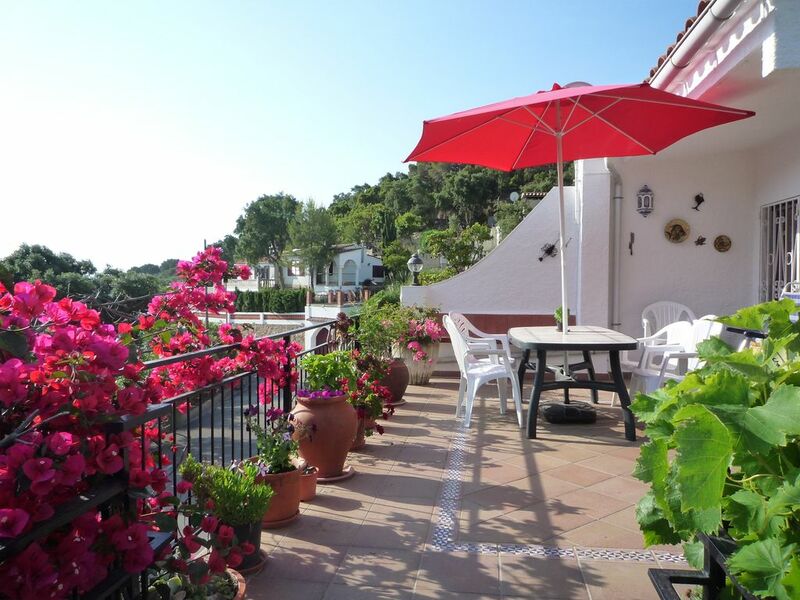 Beautiful located with great terraces with a lot of flowers. Located on a dead end street, very quiet. The owner shows great hospitality. 10 min. walk to a little beach, wonderful, almost for yourself. 2 min drive by car to a great and perfect beach Canyelles: sand, very clear water, surrounded by rocky hills and flora. Free and great swimming pool, a 2-minutes walk, also beautiful located and very quiet. The photo's show reality. The villa, location& surroundings can be recommend strongly. Thank you very much for your feedback. It was a pleasure having you in our villa. Your villa was a perfect interlude to our vacation, very clean, beautiful outdoor areas to sit and enjoy the view. After spending long days touring the area and shopping in Tossa, we always looked forward to the beautiful, peaceful pool. It was exactly what we wanted and felt at home right away, we even cooked a few dinners and enjoyed them out on the patio! Roman is a very helpful, charming young fellow and you are fortunate to have him as your agent. We would not hesitate to recommend staying at your villa and we hope to return some day. You were also very accommodating and the information you shared prior to was very helpful. Thanks so much! It was our pleasure to have you at our villa. Thank you again and best wishes. We had a beautiful holiday. The house is located in a charming and quite area. The rooms are big enough and the two terrasses have a nice vew. The swimming pool is close to the house, a bit too crowed in the afternoon and of course not so clean (compare to the 2-3 times we went in the morning). the place is perfect with kids, but the car is absolutly needed (no place to buy food, to go to the beach,,,). Thank you very much for your review on our villa. The swimming pool is normally very quiet and clean. On this occasion the person in charge did not turn up for a few days and unfortunately some guests left papers etc on the tables which they should put in the provided rubbish bins. I am in contact with the club manager about this issue. As for the importance to have a car yes I agree on this. However, for people who do not want to rent a car they still can use the buses to either Tossa de Mar or to Lloret de Mar. there is a bus every 30 minutes. The location of the bus “stop” is on the top of Playa Brava and there is no bus shelter as such you only need to signal to the bus for the bus to stop. There is no shop in Playa Brava we usually shop in the supermarkets one in Cala Canyelles (1 Km) or in Lloret or in Tossa which is 6 Km from either town (about 10 minutes by car). The nearest beach as indicated in our advert is about 15 minutes walk away down a steep hill from the villa and the next one is only 1 minute by car in cala canyelles which is large, sandy and beautiful. Das Anwesen befindet sich zwischen der historischen Stadt Tossa de Mar (6km) und dem modernen Lloret De Mar (6 km). Tossa de Mar & Lloret de Mar. A deposit of £300 is required on the date of the booking. Booking is confirmed when the deposit is paid. This deposit is not refundable.